Kid’s can’t get enough of Chicken Noodle Soup. With bite-sized chicken and slurpable noodles, you’ll love serving wholesome Chicken Noodle Soup. 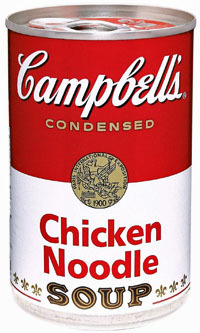 Stove top: Combine one can of soup with one can of water. Heat, stirring occasionally. Microwave: Heat, covered, in a microwaveable bowl for 3-3 1/2 minutes. Let stand for 1 minute. Remove and stir.